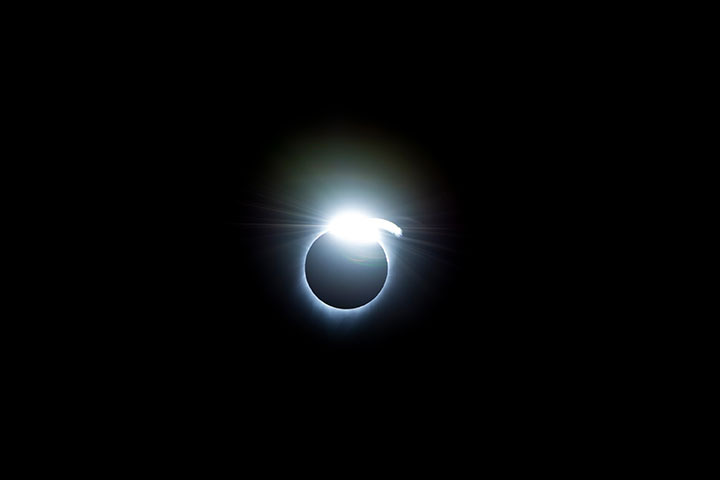 On August 21, 2017, millions of Americans saw day turn temporarily to night as the Moon passed between the Sun and the Earth to create a total solar eclipse. As people in the 70-mile-wide (110-kilometer-wide) path of totality looked up and saw blinding light replaced by a dark circle and the Sun’s wispy corona, several Earth-observing satellites captured spectacular imagery of the Moon’s shadow as it raced eastward over the continental United States. The animation above was assembled from several images acquired on August 21, 2017, by NASA’s Earth Polychromatic Imaging Camera (EPIC) on the Deep Space Climate Observatory (DSCOVR). From its position about 1.6 million kilometers (1 million miles) from Earth, DSCOVR maintains a constant view of the sunlit face of Earth. From that perspective, both the Earth and the Moon’s shadow moved during the eclipse. While the Earth itself rotated at several hundreds of miles per hour, the lunar shadow moved much faster. It took just one hour and 30 minutes for the shadow to travel across the United States, but it did not move at a constant speed. Earth’s shape caused the shadow to hit the surface at a slant—and thus move more quickly—at the beginning and end of the eclipse path. 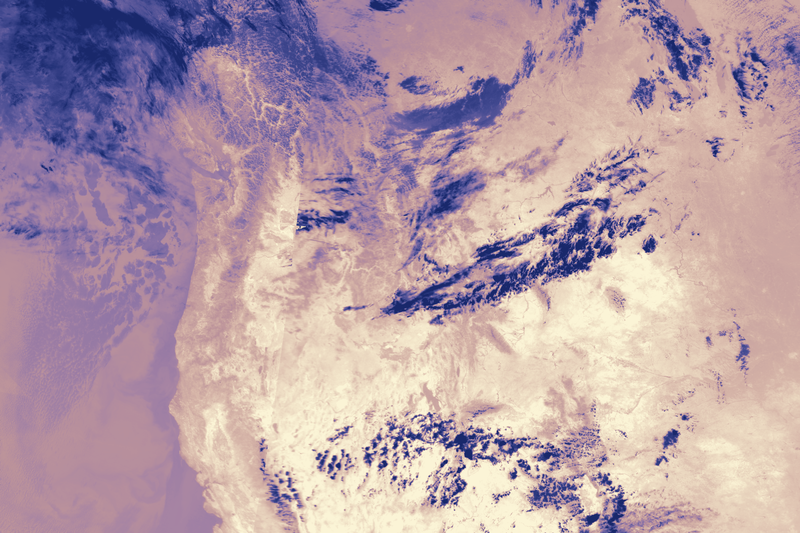 From a closer vantage point, sensors on the polar-orbiting Terra and Suomi NPP satellites gathered data and imagery in swaths thousands of miles wide. 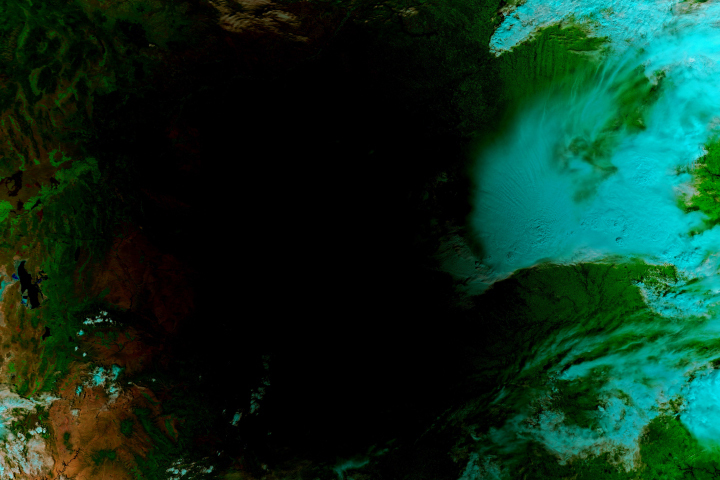 The Moderate Resolution Imaging Spectroradiometer (MODIS) sensor on Terra and Visible Infrared Imaging Radiometer Suite (VIIRS) on Suomi NPP captured the data used to make the second image, an animation that alternates between two mosaics. Each mosaic is made with data from different overpasses that was collected at different times. The right third of the MODIS mosaic shows the eastern United States at about 12:10 p.m. Eastern Time (16:10 Universal Time), before the eclipse had begun. The middle part was captured at about 12:50 p.m. Central Time (17:50 Universal Time), when the eclipse was in progress in the center of the country. 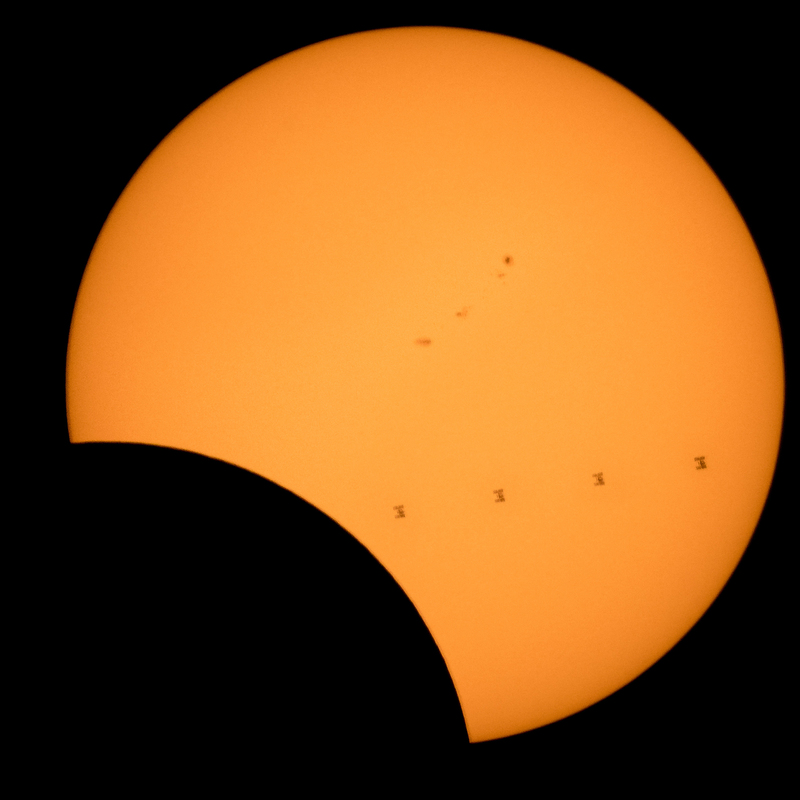 The left third of the image was collected at about 12:30 p.m. Pacific Time (19:30 Universal Time), after the eclipse had ended. 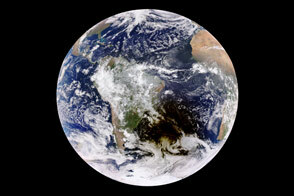 The VIIRS mosaic is similar, but it shows the shadow at 2:30 p.m. Eastern Time (18:30 Universal Time), when it had reached the eastern United States. 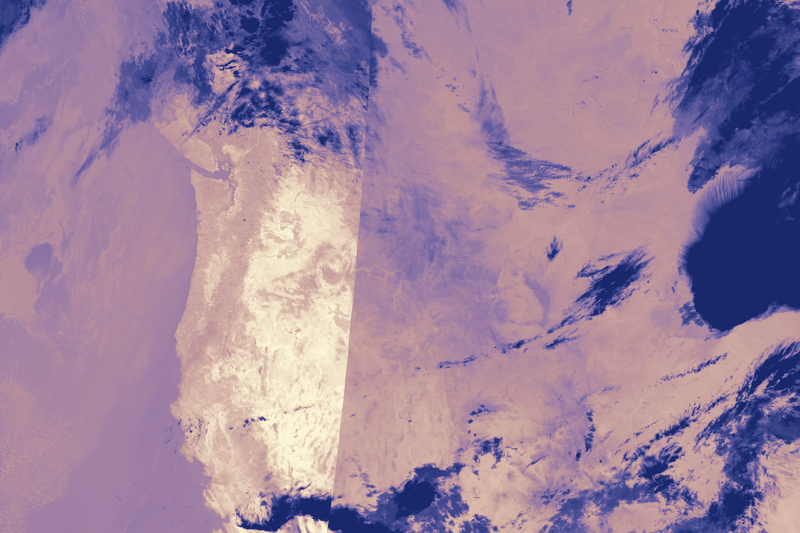 Note that VIIRS has a different orbital geometry and a slightly wider swath than MODIS. 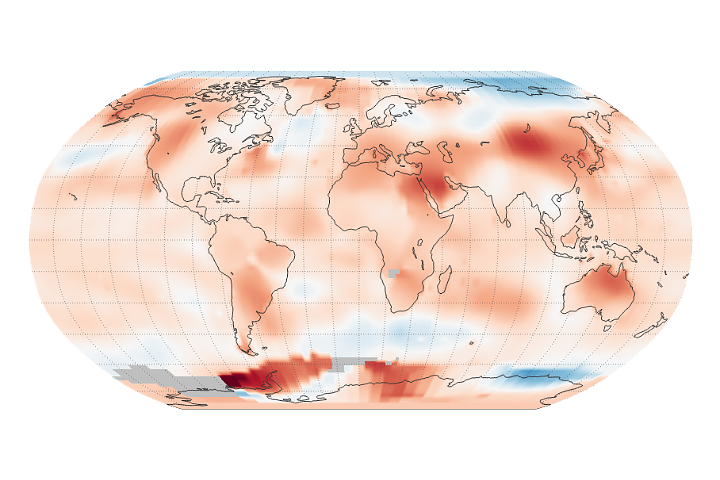 As the lunar shadow moved across the surface, satellites detected a decrease in surface temperatures. The maps above show surface temperatures as measured by Terra’s MODIS on August 19, 2017, and August 21, 2017. Notice the clear line between these two Terra overpasses on the day of the eclipse. 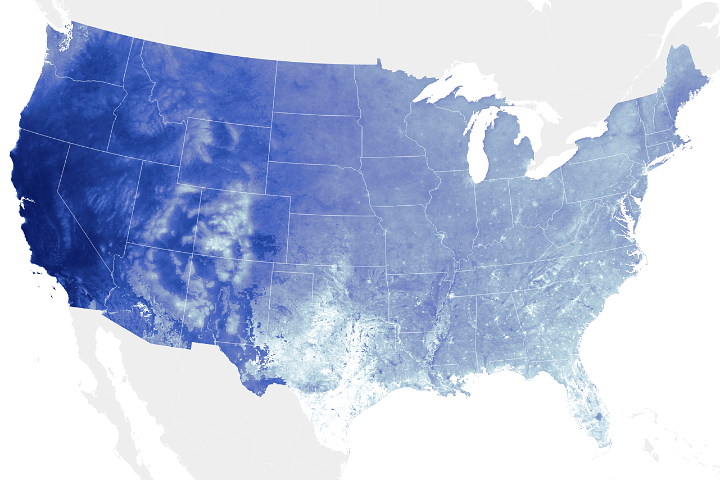 Land surface temperatures were significantly cooler (bluer) in the central United States at 12:50 p.m (17:50 Universal Time) on August 21, 2017, when Terra collected imagery of the shadow. In comparison, there was little difference in land surface temperatures between the two overpasses on August 19. Meanwhile NASA photographers on the ground, in the air, and in orbit were using their cameras to capture unforgettable views of the eclipse. The photograph below is a composite, made from seven frames, that shows the International Space Station (ISS) as it transited the Sun at roughly 5 miles (8 kilometers) per second. It was taken on August 21, 2017, from Banner, Wyoming. On board the station as part of Expedition 52 were: NASA astronauts Peggy Whitson, Jack Fischer, and Randy Bresnik; Russian cosmonauts Fyodor Yurchikhin and Sergey Ryazanskiy; and ESA (European Space Agency) astronaut Paolo Nespoli. 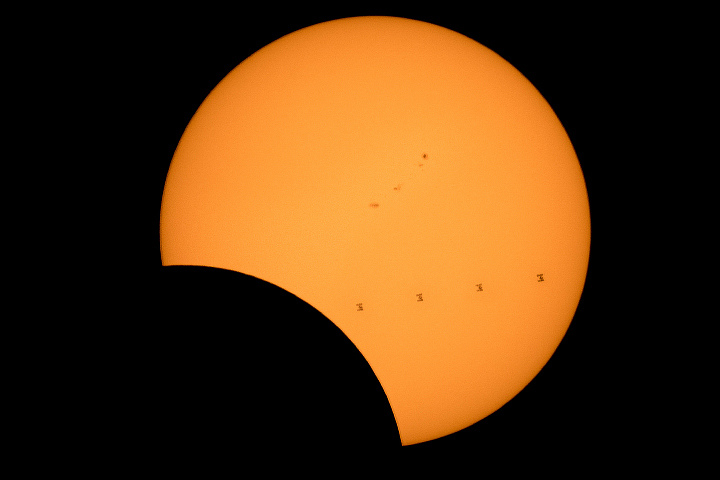 See a video of the ISS transiting the Sun here. The astronauts had a unique perspective on the eclipse. The image above shows the Moon’s dark shadow as seen from their vantage point on the International Space Station. 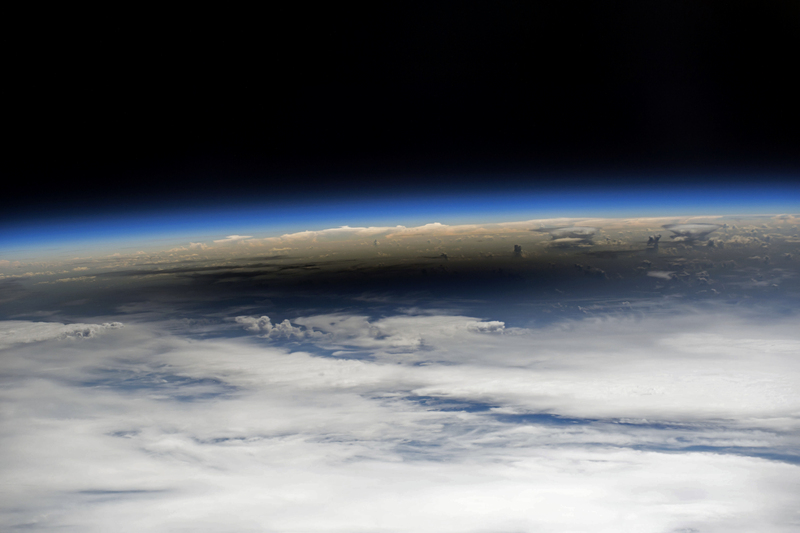 The shadow was visible near the Earth’s limb, the boundary between the atmosphere and space. The upper levels of the atmosphere faded from blue to black as many clouds lower down bubbled up and around the shadow. 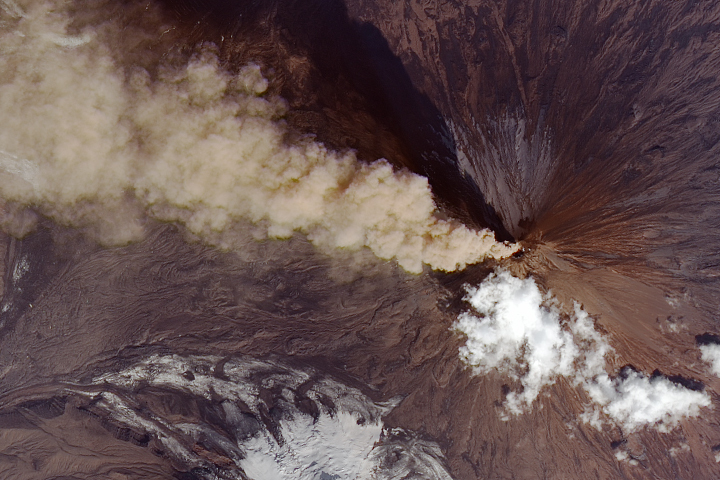 The photograph below was taken from NASA’s Gulfstream III jet while it was flying 25,000 feet (8,000 meters) above the Oregon coast. As the last bits of sunlight passed through valleys on the Moon’s limb, the faint corona around the Sun was just becoming visible, giving the Sun the appearance of a diamond ring. This effect, sometimes called Baily’s Beads, becomes visible just before and after totality. 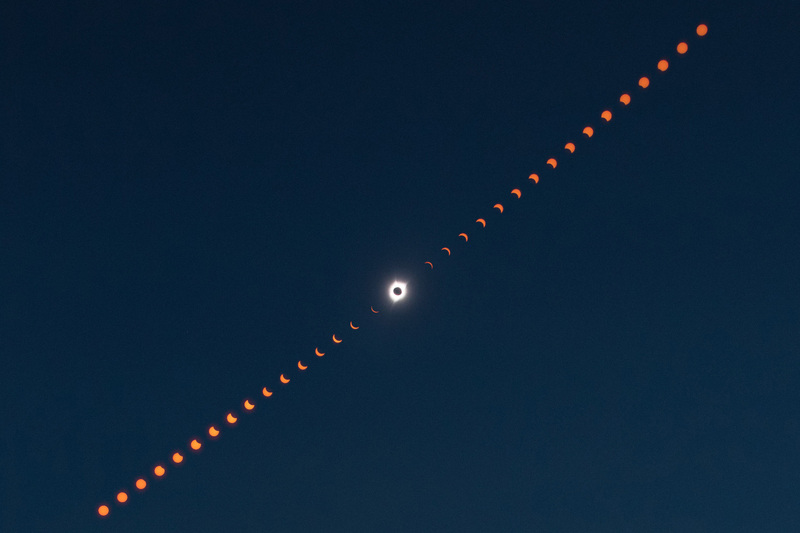 The last image is a composite photograph that shows the progression of the total solar eclipse over Madras, Oregon. NASA Earth Observatory images by Joshua Stevens and Jesse Allen, using data courtesy of the DSCOVR EPIC team. MODIS and VIIRS data courtesy of the University of Wisconsin’s Space Science and Engineering Center MODIS Direct Broadcast system. NASA photograph of the ISS transit by Bill Ingalls. NASA photograph of the diamond ring effect by Carla Thomas. NASA composite photograph of the eclipse progression by Aubrey Gemignani. The photograph taken from the ISS was published here. Story by Adam Voiland. The total solar eclipse proved spectacular whether seen from space, the ground, or mid-flight. NASA Total Eclipse. Accessed August 22, 2017. NASA Eclipse and Transit Images. Accessed August 22, 2017. NASA 2017 Total Solar Eclipse (Official HQ Flickr Account). Accessed August 22, 2017. NASA 2017 Total Solar Eclipse (Photos Submitted to the NASA Flickr Photo Pool). Accessed August 22, 2017. NASA Earth Observatory (2017, August 21) Eclipse Shadow Darkens the United States.